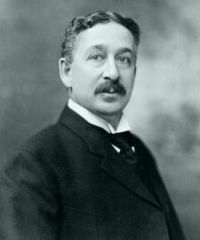 Today in Masonic History King Camp Gillette is born in 1855. King Camp Gillette was an American innovator. Gillette was born on January 5th, 1855 in Fond du Lac, Wisconsin. He was later raised in Chicago, Illinois with his entire family surviving the Great Chicago Fire in 1871 when he was 16. In the 1890's Gillette went to work for the Crown Cork Bottle and Seal Company as a salesman. It was there that he realized the advantage of a disposable product. He would daily see the bottle caps that he sold thrown away from one or two uses. At the time most men shaved with a straight razor which constantly needed to be sharpened. Gillette conceived of a safety razor, an item that had been invented many years before, although lacked the critical piece, an affordable and disposable razor blade. Gillette worked with metallurgists and others to help perfect his idea. It took the better part of a decade for Gillette to realize his vision of a disposable razor blade. Eventually a steel razor blade was created. Gillette along with his partners developed the technology to rapidly produce the razor blades and associated handle. In 1903 when the first production began, the Gillette Safety Razor Company sold 51 razors and 168 blades. The following year those numbers jumped to 90,884 razors and 123,648 blades. By 1908 the Gillette's company had grown to the point where they had factories in the United States, Canada, Britain, France and Germany. By 1915 the company was producing 70 million razor blades. At this time the Gillette company supplied servicemen fighting in World War I with a shaving kit consisting of a razor and razor blades. Around World War I, Gillette vetoed a proposal to sell the patent rights in Europe. He was convinced that the European markets would open up and they did. Gillette eventually sold out to another board member for the company who he was having an ongoing dispute with. His name remained on the company after the sale. When the Great Depression hit, Gillette lost much of his fortune. It was also in the late 1920's that Gillette was known to frequent the Desert Inn in Palm Springs, California. He was often seen wandering the lobby and the grounds in a tattered bathrobe. When the proprietor asked why she allowed such a low life to hang around her establishment she would reply "Why that is King C. Gillette. He has practically kept this place in the black the last few years." Gillette passed away on July 9th, 1932. Gillette was raised in Adelphi Lodge in Quincy, Massachusetts in June of 1901.